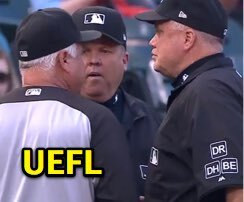 3B Umpire Fieldin Culbreth ejected White Sox Pitching Coach Don Cooper and Manager Rick Renteria (checks swing ball four call) in the top of the 1st inning of the Blue Jays-White Sox game. With none out and one on, Blue Jays batter Kendrys Morales attempted to check his swing on a 3-2 fastball from White Sox pitcher Reynaldo Lopez, ruled a ball and no swing by HP Umpire CB Bucknor and affirmed on appeal as no swing by 3B Umpire Culbreth (the pitch was properly officiated location-wise as a ball; pz 1.194 [sz_bot 1.565]). Play was adjudicated and reversed by the UEFL Appeals Board, the call was incorrect. At the time of the ejection, the Blue Jays were leading, 2-0. The Blue Jays ultimately won the contest, 10-5. These are Fieldin Culbreth (25)'s 1st and 2nd ejections of 2018. Fieldin Culbreth now has -4 points in the UEFL Standings (2 Prev + 2 MLB + 2*[-4 Incorrect] = -4). Crew Chief Fieldin Culbreth now has 2 points in Crew Division (2 Previous + 2*[0 Incorrect Call] = 2). This is the 106th and 107th ejection report of the 2018 MLB regular season. This is the 44th Manager ejection of 2018. This is Chicago-AL's 5/6th ejection of 2018, 1st in the AL Central (CWS 6; KC 4; DET, MIN 3; CLE 1). This is Don Cooper's first ejection since May 16, 2017 (Tripp Gibson; QOC = Y [Balls/Strikes]). This is Rick Renteria's 4th ejection of 2018, 1st since July 14 (Adam Hamari; QOC = Y-C [Check Swing]). This is Fieldin Culbreth's first ejection since June 29, 2017 (Bryan Price; QOC = Y [Replay Review]).